Do you want to spend a day outside of the busy Dublin city center? Do you want to take a relaxing walk at the sea or just escape your everyday life for a while? Well, then a trip to one of the Coastal Towns around Dublin is perfect for you! This post deals with some of the most beautiful towns at the cost around Dublin. They’re perfect for a day trip and it doesn’t take long to get there. Enjoy the fresh air from the sea and admire the beautiful harbours and coast lines. Malahide is a charming and quaint village in the north of Dublin. It’s mostly covered by Georgian architecture and you can find small shops, fantastic local pubs, a marina, a beach and some cafés there. If you like nature you have to do the coastal walk or go for a walk through the forest there. The most famous attraction in Malahide is Malahide Castle. Built in 1175, it was the home for the Talbot family for almost 800 years. It now has a visitor centre in it and afterwards you can visit the beautiful Talbot botanic gardens behind it. To get there you just have to take the 32 or 42 bus or the DART to Malahide to be there in 30 minutes. 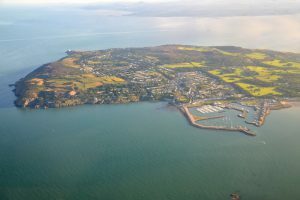 This Peninsula is an old fishing village also in the north of Dublin. It’s well known as a sea lovers paradise and you can eat some excellent and fresh seafood there. In Howth harbour you won’t find any yachts, but fishing trawlers and seals if you are lucky. Moreover, the pier is perfect for a walk near the water and Howth market offers some diverse culinary treats. You can also visit Howth Castle with the Transport Museum right next to it. The best thing about Howth is its beautiful Cliff Loop to Howth Head. This walk along the coastline offers some stunning views of the cliffs of Howth and of the lighthouse at Howth Head. Take the DART to Howth or jump on the bus 31, 31a or 31b. It just takes 30 minutes with the DART to get there. This town has probably the most beautiful and most popular pier in Ireland. First of all, the name is pronounced “Dun-Leery” to clear all questions about the pronunciation of the name. It has some hilly and pretty cobblestone streets and also a nice town hall and a bandstand at the pier. Furthermore, you can visit the People´s Park with its weekend market. The perfect partner for your walk along the pier is an ice cream from the legendary Teddy´s. They’re in business since 1950 and very famous for their tasty ice cream. 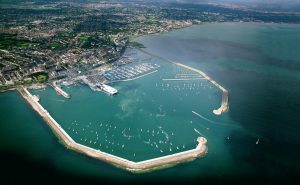 Dún Laoghaire is easily accessible by the 7,7a and 46a bus or just a 20 minute ride with the DART away. This old port town has many little harbours and you can describe it as a sleepy location with a real medieval feel to it. Several celebrities live here, like U2´s Bono, and you will find some fine bars and cafés too. You can visit the Saturday Food Market in the Tramyard or go for a boat trip to Dalkey Island. 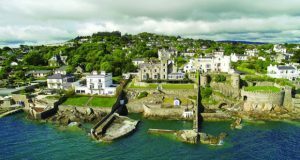 If you want to get to know more about the history of Dalkey and Ireland, I recommend the Dalkey Castle and Heritage Center. It really worths a visit and you will know a lot of things afterwards that you didn’t knew before. The best way to get to Dalkey is the DART and it just takes about 30 minutes to get there. 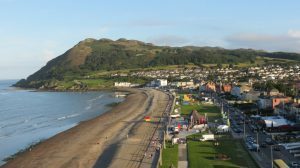 Bray is a busy seaside town with some quality cafés and seafood restaurants. It has a lovely 1.5km long promenade which is perfect for a relaxed walk. If that is to boring for you, you can hike to Bray Head, a hill that s 241m high and next to the cliffs, or you do the 7km long Cliff Walk to Greystones. It´s a beautiful walk and you can see the scenic landscapes and cliffs of Bray. Even if it rains you can do something in the former seaside resort. They have a Sealife directly at the beach and you can find a café and a restaurant there as well. You can either take the 145 bus or you take the DART to Bray. It will be a 40 minute ride along the coast with some beautiful views on top. This beautiful coastal town is a small fishing town in the south of Dublin. It was awarded in 2008 as the most liveable place in the world and its idyllic and scenic setting speaks for itself. You will have a fantastic view of the Wicklow Mountains, you can go to the beach or go for a walk at the harbour there. Moreover, they have some superb restaurants, unique specialist shops and boutiques and vintage shops too. Technically, it already belongs to the country Wicklow, but you just need to get on the DART and in just 50 minutes you are there. The train track goes along the beautiful cliffs and offers some scenic views of them. 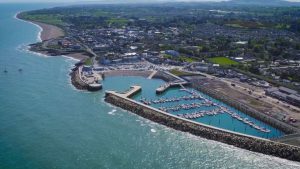 Have fun visiting these beautiful coastal towns around Dublin! !